Markets are trading lower this morning, following yesterday’s small losses. Crude gave up 29 cents yesterday after the EIA’s inventory data was published. Today, prices are falling more rapidly, with crude oil prices currently at $70.64, a loss of $1.20 (-1.7%). Fuel prices are falling in line with crude prices, after mixed trading yesterday. Both prices traded as expected given the EIA’s data, with gasoline prices falling a penny and diesel prices rising almost a penny. Today, both are falling lower. Gasoline prices are currently $2.2363, down 2.4 cents (-1.1%) since yesterday’s close. Diesel prices are falling a bit slower, but are still down 1.8 cents (-0.8%) to $2.2719. The EIA’s 10:30 AM inventory data release yesterday has been a primary driver of lower prices – given all the talk of tightening supply, why did crude inventories grow nearly 6 million barrels? In fact, tight supply may be the cause of the increase. OPIS noted that refineries could be stocking up extra crude oil to weather any supply disruptions related to Venezuela, Iran, or other geopolitical events. About half the build came in the Gulf Coast, where most of the U.S.’s refining capacity is located. 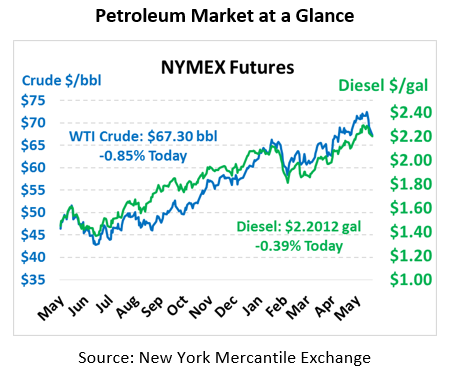 The data showed that diesel stocks continue to fall, in line with expected amounts. Memorial Day often marks a turning point for diesel prices, with inventories leveling off or rising and prices starting to decline as refineries increase output to compensate for high gasoline demand. Last year was the first year that diesel inventories fell during the summer, largely attributable to Hurricane Harvey. Analysts will be watching inventories closely this summer to see if that pattern returns this year. If diesel inventories don’t start building soon, diesel prices could begin climbing quickly.